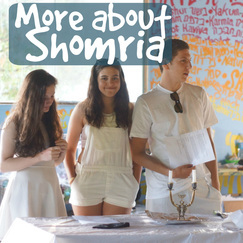 Every camper eagerly awaits their annual return to Camp Shomria! For many, it makes the summer their favorite time of the year. We use our camp to run 6 weeks of recreational, social, and educational programming in an intentional environment that we create together; one that is built on kibbutz-style living, and cultivates an incredible sense of ownership of responsibility for each other and our space, from each and every camper and counselor. Our youth village is run by a talented group of madrichim (counsellors) who have grown up learning and living the values of the movement, and have exceptional experience in a completely unique style of informal education that we have made our own. Each kvutza (age group) is prepared a comprehensive tochnit (curriculum) involving communal responsibility and sharing, leadership, Jewish values, Israeli culture, critical thinking, moral and ethical analysis, tikkun adam (bettering the individual), tikkun olam (bettering the world), as well as so much more; intertwined with intentional building of group relationships and friendships that last a lifetime. Our educational curriculum is expressed through tools such as games, sports, arts and crafts, nature exploration, canoeing, music, singing, and rikud (dance). Our skilled staff use these elements to invent creative activities and write nightly plays and evening productions that cover an array of genres that can be moving, inspiring, or hilarious.